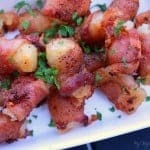 Bacon Wrapped Tater Tot Cheese Bombs - a recipe with tater tots, cheese, bacon, spices and fresh parsley. They are salty, crispy, cheesy one-bite flavour bombs - a great appetizer recipe! Take a Tater Tot and push knife into center to make a little space inside and push a square of cheese inside. The Tater Tot might break in half a little, but it's alright. The bacon will hold it together nicely. As you do more tots, it'll get easier to keep the tot intact. Once the cheese cube is in the tot, wrap a half-slice of bacon around the tot. Pull on the bacon a little if you need to, to ensure some overlaps. Place in pan, bacon seam side down so it's held together. Continue doing this will all the tots until they are all wrapped and in the pan. Sprinkle desired amount of pepper and garlic salt over the tots. I like to be generous with the spices, myself. Bake for 20 minutes and then turn each bacon wrapped Tater Tot over and bake for another 10-15 minutes until bacon is cooked and is starting to crisp up nice. When done, put bacon wrapped tots onto paper towel on a plate. Sprinkle fresh parley over them and let cool a few minutes before eating.